Colin Kaepernick has filed a grievance against the NFL, alleging that his continued unemployment is the result of collusion among NFL owners. The news was first reported by Mike Freeman of Bleacher Report, and a source has since confirmed to Deadspin that the grievance has been filed. 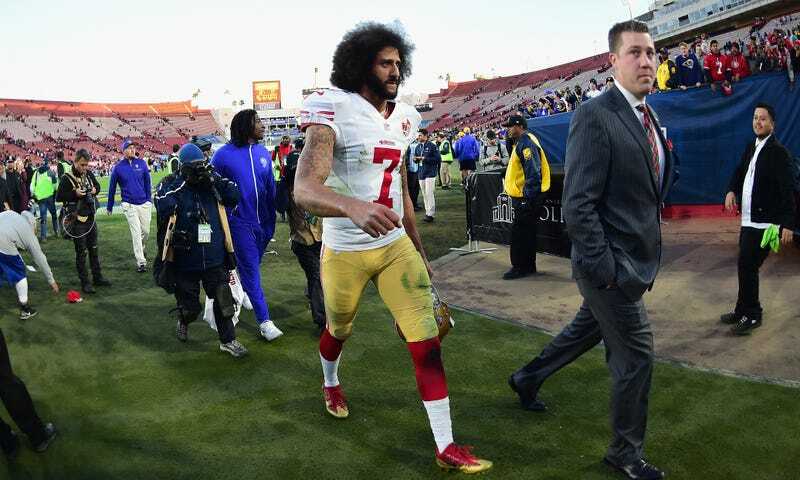 Kaepernick has been unemployed since opting out of his contract with the 49ers in March. A major subplot of this NFL season has been the parade of underqualified stiffs getting under center for various NFL teams, while anonymous team executives and their media mouthpieces make ever more desperate-seeming cases for why Kaepernick—a perfectly fine NFL quarterback as recently as last season—is both less qualified than the useless Brock Osweiler and less committed to the sport than a retired Jay Cutler. (v) concerning the terms or conditions of employment offered to any player for inclusion, or included, in a Player Contract. (b) Any approval or disapproval of a player’s contract by the Commissioner, or any communication thereof, timely notice of which is provided to the NFLPA, cannot be the basis of any claim of collusion. The NFLPA or the affected Player shall have the right to appeal the Commissioner’s disapproval of such player contract to the System Arbitrator, pursuant to Article 15 and Article 14. Section 6. Burden of Proof: The failure by a Club or Clubs to negotiate, to submit Offer Sheets, or to sign contracts with Restricted Free Agents or Transition Players, or to negotiate, make offers, or sign contracts for the playing services of such players or Unrestricted Free Agents, shall not, by itself or in combination only with evidence about the playing skills of the player(s) not receiving any such offer or contract, satisfy the burden of proof set forth in Section 1 above. However, any of the types of evidence described in the preceding sentence may support a finding of a violation of Section 1 of this Article, but only in combination with other evidence which, by itself or in combination with such evidence, indicates that the challenged conduct was in violation of Section 1 of this Article. Nothing in this Agreement shall preclude the NFL or its Clubs from arguing that any evidence is insufficient to satisfy the burden of proof set forth in Section 5 above. Nothing in this Agreement shall preclude the NFLPA or any player from arguing that any evidence is sufficient to satisfy the burden of proof set forth in Section 5 above, except as set forth above. Translation: Proving collusion will require more than establishing what we already know, which is that Kaepernick is the most qualified man for many of the jobs he hasn’t gotten.